Chillies are native to Central and South America, where they were cultivated for thousands of years before the Spanish conquests. -> Loaded with vitamin A, a potent antioxidant and boost to the immune system. -> High in vitamin C, though as the pods darken the capsaicin levels are at their highest replacing the vitamin C with beta carotene. 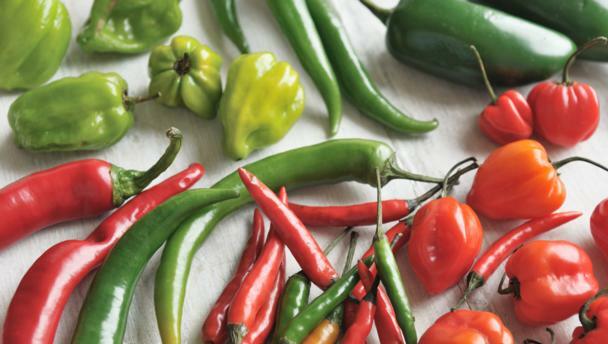 -> The heat of the chillies temporarily boost your metabolism, making you burn calories faster. Although chillies have many health benefits, you should be cautious if you’ve never had strong chillies before, as they irritate your stomach. Start from the bottom up, and definitively don’t be intimidated by the chillies! Chillies are classified on the Scoville scale based on their capsaicin content. The fiery sensation of chillis is caused by capsaicin, a potent chemical that survives both cooking and freezing. The quantity of capsaicin varies in each chilli, which is why not all chillies are equally hot. Tip: removing the seeds from the chilli reduces its heat. What if I can’t find a specific type of chilli? You can usually substitute chillies if they are in the same Scoville ranking.